The church is a living organism designed to grow. Growing churches are often one big decision from getting unstuck. These big decisions are often predictable. 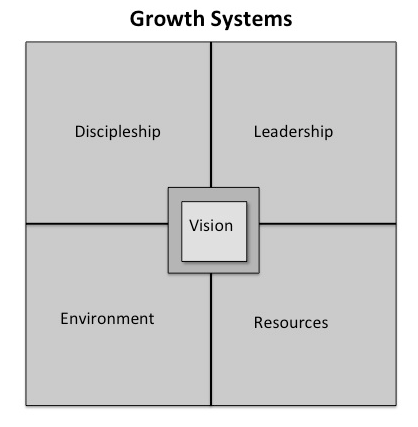 As a result of this work I’ve put together a little model that has help me in working with growing churches. Represented in the model below are five areas to which every church, regardless of model or context, must pay attention. Let me give you a brief overview. What are we doing (mission)? Why are we doing it (values)? How are we doing it (strategy)? When are we successful (measures)? Where is God taking us (vision proper)? They have spent hours in prayer and scripture seeking God’s heart. They have taken their team through a healthy process to discover God’s vision for their church. They have crafted a culture, shaping language to articulate their unique vision with absolute clarity. They value the “law of the outsider” and have consulted with someone who can help them navigate this unique journey. 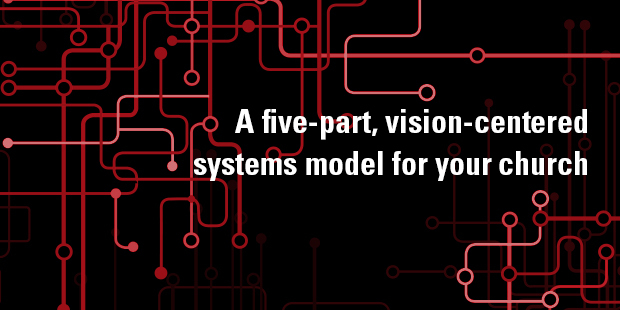 They focus on implementing the vision frame over time. Leaders who lack in vision ultimately end up getting stuck. Churches often get stuck when the churches growth outpaces that of the leadership. This is why it is so important that we understand in order to grow the church, we must grow the leader. Visioneer – Ability to discover, to communicate, and implement vision. Communicator – Ability to communicate God’s word in a gospel-centered, passionate, and relevant way. Team Leader – Ability to discern leadership, develop a leadership pipeline, develop new leaders, and execute ministry through others. Funder of Mission – Ability to create a culture of generosity and raise capital for big endeavors. Vitality – Ability to grow personally, emotionally, spiritually, intellectually, and professionally over the long haul. How are disciples made in this context? What are the measures of a disciple? Space is important. I wish it wasn’t. It would make our work and lives much easier. At the end of the day when a church runs out of space or has a poor environment it causes growth to slow and often time stop growing. I often get inquires from new church planters wanting help for their lack of growth. Many times it’s simply hindered by their meeting environment. Many of our church buildings were built during a time when Christianity was the dominant worldview in the US. That is no longer true. We must become much more intentional about our environments if we are to reach people who begin their journey with their backs toward Christ and the church. Our partners at Visioneering Studios understand this. I first encountered them at a conference during an Architectural Evangelism presentation. We (Mountain Lake Church) were well into our design phase of a new worship space. We were so convicted about the importance of space and environment that we ditched our project and began from scratch. Growing churches that resolve the space and environment issues most often explode in growth. A healthy practice is to utilize a Guest Service Perspective. This service is designed to have a consultant who is trained in space and environment issues come in and do a kind of secret shopping experience in your church context. A lack of funding is one of the best ways to kill a good idea. The same is true for churches and ministry. 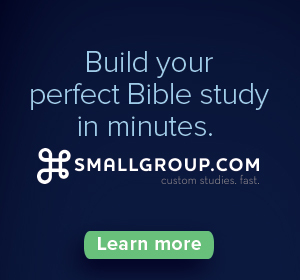 This is among the top two or three issues I deal with in helping fast-growing churches. Vision most often out paces our resources. Without exception, I watch young churches hit the financial huddle sooner or later in their ministry. Failure to disciple new and existing disciples in generosity. Somewhere along the way we bought into the lie that people won’t come to your church if you talk about money. No practical tools for teaching people how to get out of debt, budget, and give. The number one tool for increasing a churches financial health over the long haul is a consistent financial ministry for the people, by the people. 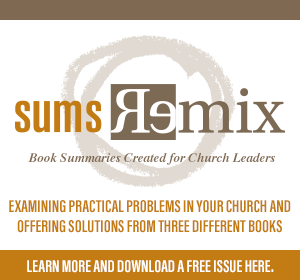 Lack of healthy financial systems in the church. Churches consistently spend inordinate percentages of their income on staffing and facility-related issues. A balanced budget with appropriate checks and balances goes a long way. Lack of communication about church finances. People often feel in the dark when it comes to church finances. We ask them for their money, but we refuse to tell them how God is using it. Failure to conduct discipleship-oriented capital campaigns. Churches make two common mistakes when it comes to raising capital for specific needs. First, they often fail to hire an outside consultant. Research consistently demonstrates that a consultant makes a huge difference when it comes to a campaign. Secondly, they conduct a poorly executed campaign. When conducting a campaign you must go all in. A well-done campaign can compel a church into the future, enabling you to overcome the barriers that come along with lack of funding. As a part of the Auxano Team we are eager to serve you and your church as you deal with those natural barriers of a growing church. Don’t hesitate to contact us. We offer a number of on-site consulting services. They include: Vision Pathway, Resourcing, Leadership Pipeline, Communications, and StratOps.